Thus efforts continue unabated. In 2012 there was a worldwide meeting, the Child Survival Call to Action, which set a goal date of 2035 for reaching fewer than 20 deaths per thousand live births in all countries. In addition to these ten behaviors, USAID identified behaviors related to each which contribute to improving the enabling environment to effectively carry out the accelerator behavior and may be bundled with other accelerator behaviors. The full list of accelerator and related behaviors can be accessed here. This Trending Topic provides several resources and project examples for addressing each of the 10 behaviors. However, there are many more materials in the Health COMpass and you should conduct a search on the particular behavior or behaviors that your project is focusing on. The Behavior Change Framework is designed to help mainstream behavior change activities in the global health agenda for Ending Preventable Child and Maternal Death (EPCMD) by identifying the behavior changes that can have the highest impact on mortality reduction. This document outlines the next steps in the efforts to lower the number of maternal and child deaths. The Water, Sanitation, and Hygiene Improvement Training Package is intended to support the training of local outreach workers and their subsequent work in communities to promote improved water, sanitation and hygiene (WASH) practices to reduce diarrhea. This is a reference and educational tool for people who create communication materials. If you’re new to materials development, we recommend that you read through the guide before actually starting to develop materials, then carefully follow the eight steps described below and covered in detail in the guide. 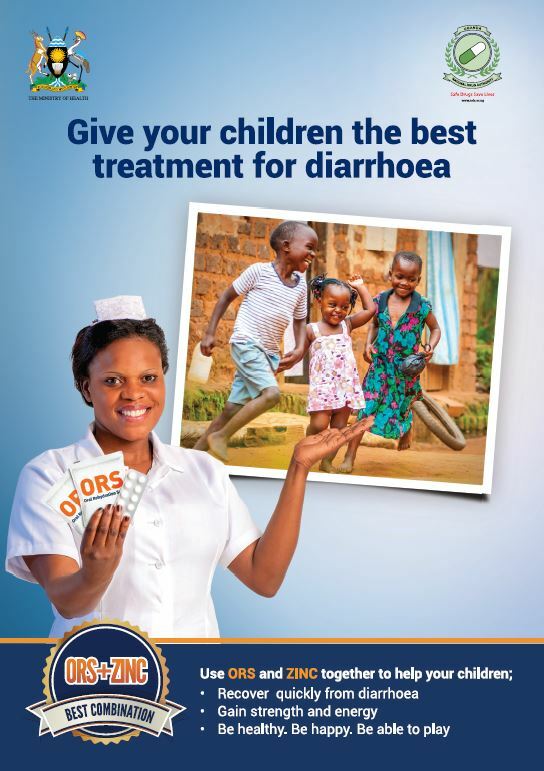 The purpose of this poster is to promote the use of oral rehydration salts (ORS) with zinc tablets to treat and prevent childhood diarrhea. 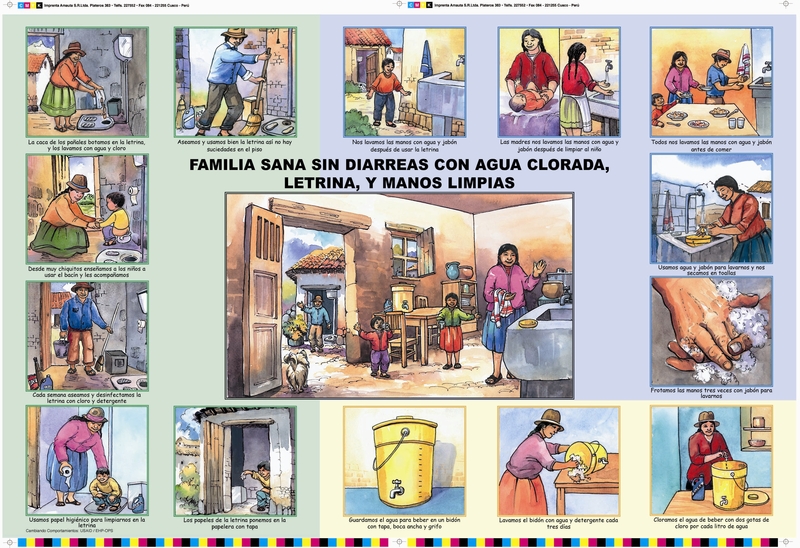 This card is part of a set produced by projects in Peru and Nicaragua aimed at reducing diarrheal disease incidence, even in communities with adequate latrines and piped water. It illustrates the various ways a family uses and stores water so as to minimize the possibility of diarrhea. 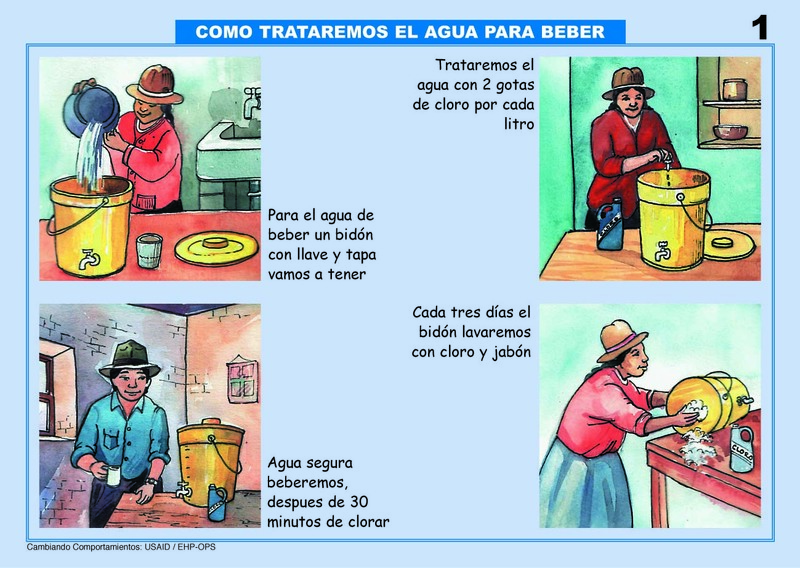 This card is part of a set produced by projects in Peru and Nicaragua aimed at reducing diarrheal disease incidence, even in communities with adequate latrines and piped water. Drinking water advisories are issued in response to a specific event or situation. Communication materials can be prepared in advance to prepare for these kinds of events. This toolbox outlines the questions and information that a drinking water advisory must address. The Suaahara ("good nutrition")program works with the Government of Nepal’s existing systems and supports the Government in addressing undernutrition and related health issues of women and children under-two years of age. This booklet for mothers and caregivers of children under 2 focuses on the importance of the first 1,000 days of a child’s life as the best investment for child growth and development. 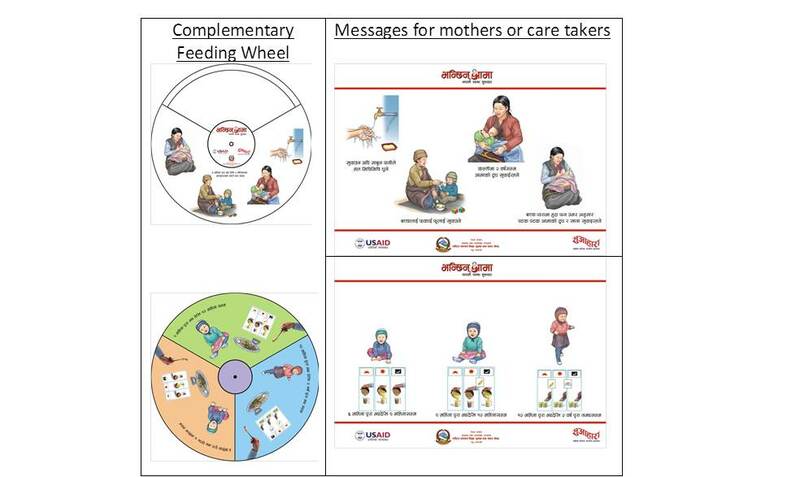 The complementary feeding wheel is an interpersonal communication tool designed for low literate community mobilizers to talk to family members about how to feed their child. 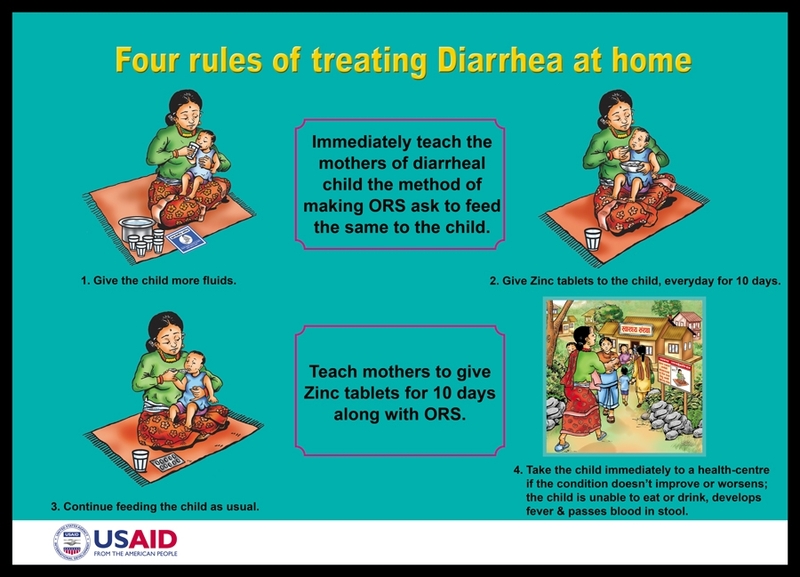 The USAID-funded Suaahara ‘Good Nutrition’ Project’s Bhanchhin Aama (“Mother says”) campaign comprehensively integrates nutrition, sanitation, agriculture and health services promotion to improve health outcomes. The program focuses on families within the 1000 days from pregnancy till the child is two years old. The Communication Framework and Plan is a component of the National Infant and Young Child Feeding (IYCF) Strategy and its goal is to contribute to the reduction of undernutrition and death caused by sub-optimal infant and young child feeding practices. This is a series of pamphlets for health workers in Bangladesh to use when visiting homes and clinics and teaching about reproductive health and child health. The kit includes materials on the following topics: maternal and newborn child health, family planning, nutrition, antenatal care, adolescent health, and safe water and hygiene. The Uganda Go Together, Know Together campaigned was a national couples HIV counseling and testing campaign. One of a set of posters from the NetCare project in Nigeria promoting behaviors to increase the lifespan of malaria nets through careful handling and repair. This poster shows how to roll up or tie up a net when it is not in use, to keep it away from children and thus prevent it from tearing or from other damage. This toolkit is a resource for communication materials designed to promote testing for malaria and adherence to test results. This site includes radio and print materials aimed at parents and the general public. This pamphlet lists frequently asked questions and answers about LLINs such as how to care for tears in the nets, who should take care of nets in the household, and how to wash the net. This is one of a set of posters from the NetCare project in Nigeria promoting behaviors to increase the lifespan of malaria nets through careful handling and repair. 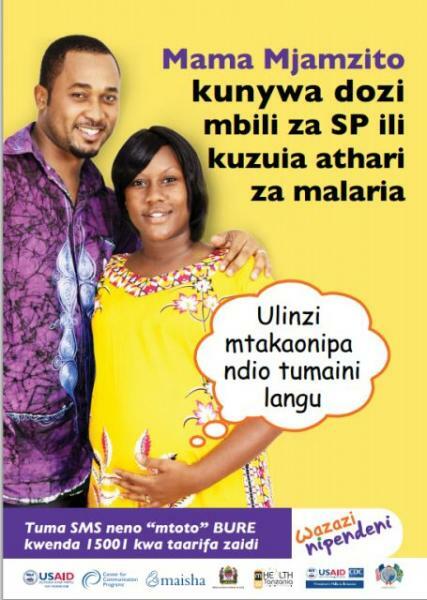 The poster shows a father identifying and fixing a hole in a mosquito net. This is a flipchart from Cambodia to be used by service providers to guide them in how to treat children with pneumonia. Emphasis is placed on motivating mothers to save their child's life by using the medication correctly, according to the updated national guidelines.